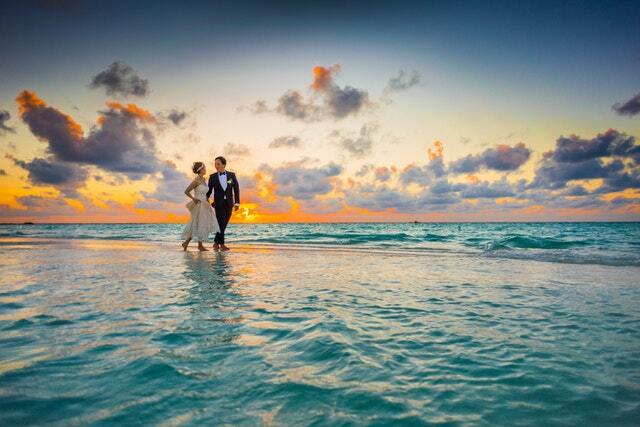 Have you made your mind about marrying on the beach? It’s time you make preparations, accordingly, starting with how you look. Sure, you can’t expect to dress up in a traditional gown, you need to dial things down a bit. Following, we are giving a few guidelines that will help you get ready for the special day without sacrificing any niceties. Yes, you want to tie your hair tight for the occasion perfectly. But you should consider the fact you are marrying on a beach. The weather can ruin your hair easily. Therefore, you are better off with a simple and easy to manage hairstyle. Beach weddings can be windy, and you don’t want your hair to be tangled or get in your face. In case you want to wear them down, get a pretty clip or a few bobby pins. They will help keep your hair in place. If you want to look stunning, try a simple, chic and one-tone dress. Don’t worry; you can still lighten the mood with bold colored accessories. Find accessories with fun and bright colors that have interesting patterns. You can wear long earrings or even hoops to complement your neckline. Add a pretty clip to your hair. Since you are tying the knot at the beach, make sure you wear a light sweater, jacket or a shawl. You don’t want to get sick on your big day. Also, don’t forget to bring a clutch or mini purse. It will come in handy. When it comes to choose the ideal choice to go with beach wedding dresses, mind the sand. So, avoid stiletto heels and wedges. They are not sensible or at least comfortable for beach wedding. If you want to keep your feet safe, wear shoes. If you don’t want to wear shoes, then you can go barefoot. If you are not saying your vows inside a venue, then get some sandals or ballet flats to match your dress. Yes, slides are also an option. The story doesn’t end here, leather loafers and mules can also suffice. Just avoid suede because it won’t last in sand and water. In case you have an undying love for heels, try low heels because they can bear sand. Don’t forget to add waterproof mascara with little natural highlighter on top of cheeks. This sort of makeup is ideal for lightweight wedding dresses. It’slikely your wedding will take place during the day. Considering you are at the beach; the sun might be on top of you. So, you need to find a way to protect yourself from the sun. Get a sun hat and sunglasses to avoid getting sunburned.